to cooperate in appropriate ways with other national and international groups having similar interests. certification that the person named as institutional member has the primary leadership and administrative role in the institution for international education programs, activities and services of the institution. Persons certified as institutional members of AIEA carry full privileges of voting and office holding and will be the recipient of institutional subscriptions to Association journals and publications. An institutional member may designate in writing to the President an associate member from the same institution to serve as institutional member for voting purposes at association business meetings. B. Other individuals at educational institutions holding institutional membership in AIEA may participate in the meetings and activities of the AIEA as Associate Members of the Association. Associate members are non-voting members of the Association and may not hold elected offices in the Association. C. AIEA Counselor membership is open to individuals of distinguished merit and long tenure in the field of international education administration, who have been associated with an institution of higher education, and who are recommended for this category by a two-thirds majority vote of the membership committee and of the executive committee. Counselors may not be elected to the offices of President or Vice-President, but may be appointed or elected to other offices of the Association. Except in capacities as an appointed or elected officer of the Association or as a member of an AIEA committee, counselors are non-voting members. D. Interim Institutional Members are those representing institutions whose international education organization, programs and/or activities are not yet developed to the point where the institution would qualify for institutional membership as defined above, but whose institution subscribes to the multiple function, leadership and administrative role of the position of primary international education administrator. The status of interim institutional membership is normally limited to a five year period. Interim institutional members are non-voting members and may not hold elected offices in the Association. AIEA shall hold one general meeting a year during the period of February through April, part of which meeting will be devoted to the business of the AIEA. Other meetings may be called at the discretion of the Executive Committee. Procedures at all business meetings of the Association shall be according to Roberts Rules of Order Newly Revised. A quorum at the business meetings of the Association consists of all institutional members present at the business meeting. A. The elected officers of the Association shall be a President and a Vice-President. The Vice-President shall succeed to the Presidency. The terms of the President and the Vice-President shall be from the close of the annual meeting until the close of the next annual meeting. Candidates for office must be institutional members in good standing. B. An Association Editor will be appointed by the Executive Committee from the institutional or at-large membership of the Association, and will serve a two year term. The Editor may be re-appointed at the end of each term and will be a non-voting member of the Executive Committee. C. The Executive Committee will appoint an Association Secretary, and a Director of the Association Secretariat and Treasurer from the general membership of the Association. The Secretary and the Director of the Secretariat will each serve terms of three years, may be re-appointed at the end of each three year term, and shall be non-voting members of the Executive Committee. D. The Executive Committee shall consist of the Immediate Past President, the President, the Vice-President, the Editor, the Secretary, the Treasurer, the Director of the Secretariat and elected members-at-large. Members-at-large shall be elected from the institutional membership on a rotational pattern of three year terms. The initial terms and rotational patterns will be established in the By-Laws of the Association. The number of members-at-large of the Executive Committee shall be determined by vote of the membership through amending the By-Laws of the Association. Local arrangements Chairpersons for the annual meetings of the Association may be appointed by the Executive Committee after determination of a site for these meetings and will be ex-officio non-voting members of the Executive Committee during their terms of service. The Executive Committee shall direct the work of the Association according to the general policies determined by the membership and shall conduct the daily business of the Association and control its funds. The Executive Committee will meet at least once apart from the annual Association meetings. A majority vote on all matters shall be considered binding for Executive Committee decisions. A quorum shall consist of a simple majority of the number of voting members of the Executive Committee. The President shall preside at all business meetings of the Association and at all meetings of the Executive Committee. The President shall appoint such special and standing committees as the Executive Committee deems necessary to the efficient operation of the organization. The Vice-President shall undertake such duties as the President shall designate and shall be principally responsible for making all arrangements in connection with the programs to be held by the Association. In addition, this officer shall preside in the absence of the President and assist the President in the execution of business. The Vice-President shall succeed to the Presidency. The Editor shall be responsible for all aspects of publication by the Association. Specifically, the Editor will represent the Association on the Editorial Advisory Board of the Journal of Studies in International Education, a journal published jointly with several other professional associations. The Secretary shall record the minutes of each official meeting of the Association, maintain all official documents and correspondence of the Association, and maintain a register of all members, unless otherwise specified. The Director of the Secretariat/Treasurer is responsible for managing the day-to-day operations of the Association under the supervision of the officers and the Executive Committee. In additiion, this officer will conduct the financial affairs of the Association, including collecting dues, making all disbursements by check, arranging for an annual external audit and present written financial reports at all regular meetings. The Immediate Past President shall serve as chairperson of the Nominating Committee, and shall act as resource person for the Executive Committee. F. A vacancy in any office shall be filled by an appointment by the President with approval of the Executive Committee. If the office of the President becomes vacant, the Vice-President shall serve as President for the remainder of that term and will succeed to the Presidency for the following year. An individual who is appointed to fill a vacancy in the position of Vice-President may succeed to the Presidency only upon majority approval of the voting membership of the Association. A. Standing committees of the Association shall be Membership Committee, Public Policy Committee, Campus Administration and Programs Committee, Research Committee, Diversity Committee. Chairs of standing committees shall be appointed by the President for three year terms and may be re-appointed to a second term. Membership on standing committees is open to all members of the Association. B. Ad hoc Committees may be created by the Executive Committee of the Association. Members of ad hoc committees are appointed by the President for durations appropriate to the charge of the respective committee. Chairs of ad hoc committees will be appointed by the President. The Nominating Committee shall be a recurring ad hoc committee appointed on an annual basis (see Article VII on Elections). A. A Nominating Committee consisting of institutional members of the Association shall be appointed and charged by the Executive Committee to solicit nominations from the general membership and prepare a slate of candidates. B. The proposed slate of candidates shall be announced in writing to each institutional member of the Association prior to the annual meeting. C. Elections shall take place by secret mail ballot with results announced at the annual business meeting of the Association. Ballots shall be collected from institutional members and counted by the Nominating Committee. A majority vote shall decide all elections. Amendments to the Constitution and By-Laws must first be approved by a majority of the members of the Executive Committee or submitted to the President in a petition signed by at least 25 percent of institutional members. Any proposed amendment shall be distributed in writing to all members prior to a vote on the amendment. To become effective, the proposed amendment must be ratified by a two-thirds majority vote on all institutional members or by a two-thirds majority vote of the quorum at the annual business meeting. NOTE: these bylaws were replaced with updated bylaws in 2015. The dues for members and affiliates shall be determined annually by the Executive Committee and will be due and payable prior to the last day of January. The AIEA will accept applications for affiliation with the Association from organizations and individuals interested in international education administration. Applications from prospective Affiliates will be considered by the AIEA Membership Committee, which will notify applicants of acceptance or rejection of their applications. Affiliates of the Association will receive all notices and publications of the Association and will be invited to attend and participate in a non-voting capacity in all meetings of the AIEA. 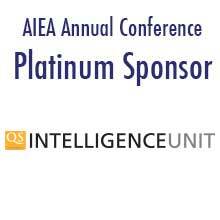 An organization accepted for affiliate status may designate more than one individual associated with that organization to receive all notices and publications of AIEA, and to be invited to participate in a non-voting capacity in the activities of the AIEA, provided that the affiliate organization pay an annual fee for each such individual as determined by the Executive Committee. All monies shall be disbursed by the Director of the Secretariat/Treasurer with notification to the President and regular reports to the Executive Committee. Members of the Executive Committee shall be expected to attend all meetings. Failure of a member to attend any two consecutive meetings shall constitute an automatic resignation from the Committee. Vacancies shall be filled for the remainder of an elected term by a majority vote of the continuing Executive Committee members. The number of members-at-large of the Executive Committee shall be at least five and may not exceed ten percent of the number of institutional members of the Association. The exact number of members-at-large will be determined by the Executive Committee and announced in its annual charge to the Nominations Committee. Members-at-large elected at the annual meeting closest to the date of ratification of these By-Laws, and those newly elected in years in which the actual number of members-at-large changes, shall be elected to staggered terms as necessary to establish a rotational pattern in which approximately one third of the members-at-large will be elected each year. Study abroad and student exchange activities. Foreign student and/or scholar affairs. International contracting (including technical assistance programming). Representation of the institution in international fora. Area, international and/or foreign language studies. Special international training programs including intensive English and other special language training. Internationally oriented community and outreach activities. The AIEA Editor shall have responsibility for the appointment of an AIEA Editorial Board whose purpose is to assist the Editor in the development of editorial policy, in the review of proposed articles, and in other ways requested by the Editor. The Editor shall select members of the Editorial Board from a list of eligible members approved by the Executive Committee. The number of members of the Editorial Board and their terms of office shall be determined by the Editor with the approval of the Executive Committee. The annually appointed AIEA Nominating Committee, in addition to preparing a slate of candidates for Association elections, will also prepare a list of candidates for membership on the Editorial Board.